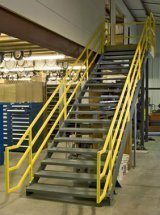 All Panel Built stair systems and components are engineered, fabricated and powder coated at our plant for a lasting finish and fast delivery. Each system is manufactured to your specification allowing for various sizes, heights and specialty handrails that meet OSHA, IBC, UBC and BOCA codes. Featuring solid steel construction and a powder coat finish, Panel Built cage ladders are engineered to meet OSHA specifications. Ladders feature a flared entry for easy access and include a steel base mounting bracket.